IRS Form 8582 or the "Passive Activity Loss Limitations" is tax form released and collected by the United States Internal Revenue Service. The January 1, 2017 fillable version of the 8582 Form can be downloaded below in PDF-format. The IRS-issued "Passive Activity Loss Limitations" is available for digital filing or can be filled out through the Adobe Reader application on your desktop or mobile device. Attach to Form 1040 or Form 1041. Go to www.irs.gov/Form8582 for instructions and the latest information. Caution: Complete Worksheets 1, 2, and 3 before completing Part I. 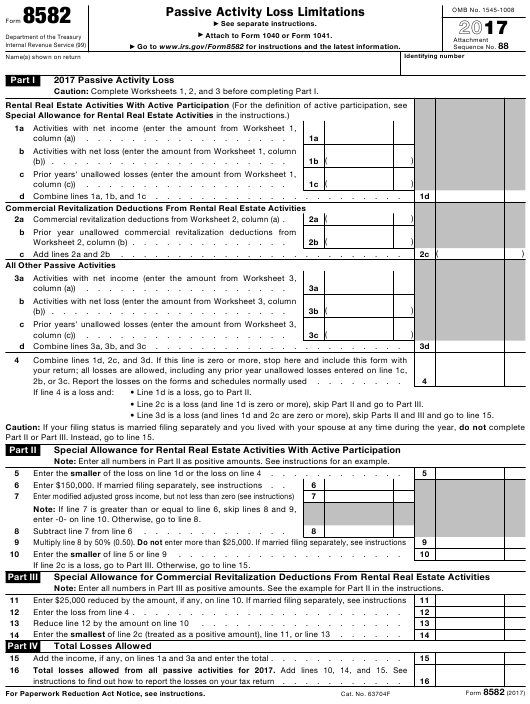 2 a Commercial revitalization deductions from Worksheet 2, column (a) . Worksheet 2, column (b) . • Line 1d is a loss, go to Part II. • Line 2c is a loss (and line 1d is zero or more), skip Part II and go to Part III. • Line 3d is a loss (and lines 1d and 2c are zero or more), skip Parts II and III and go to line 15. Part II or Part III. Instead, go to line 15. Note: Enter all numbers in Part II as positive amounts. See instructions for an example. Enter $150,000. If married filing separately, see instructions . enter -0- on line 10. Otherwise, go to line 8. If line 2c is a loss, go to Part III. Otherwise, go to line 15. Note: Enter all numbers in Part III as positive amounts. See the example for Part II in the instructions. Enter the loss from line 4 . Add the income, if any, on lines 1a and 3a and enter the total . instructions to find out how to report the losses on your tax return . Caution: The worksheets must be filed with your tax return. Keep a copy for your records. loss from form or schedule .